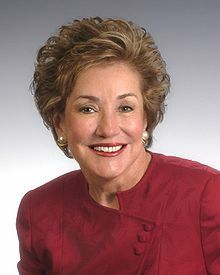 Elizabeth Hanford Dole (born July 29, 1936) was a United States Senator. She was the Secretary of Transportation in Ronald Reagan's administration and the US Secretary of Labor for George H.W. Bush. She is the wife of former Senator Bob Dole, who ran for president but did not win. This page was last changed on 23 August 2014, at 07:18.